Sky are well know for their Sky Sports TV channels. They now offer sports fans the chance to bet on 1000's of sports every day via their mobile apps. New customers receive £10 COMPLETELY FREE. No deposit needed. We no longer recommend SkyBet to our readers following the companies sale in 2015. The quality of the mobile software has suffered greatly under the new management team and is now very buggy and unstable. 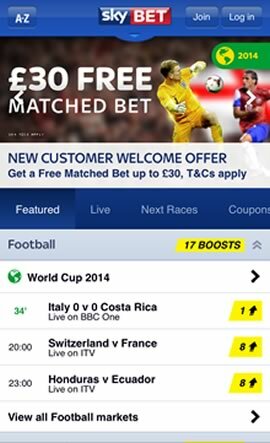 Sign-up and get a free £30 matched bet plus get Get a £5 free bet every week. Watch free live streams of Spanish La Liga games on your iOS/Android device. Apps available for iPhone, Samsung, Motorola, LG, Nokia Lumia, Sony Xperia. Watch all Racing U.K. horse races on your phone from 30 U.K. racecourses. Listen to SkySports radio on our phone to keep up-to-date on your favorite sports. Place accumulators quickly and easily though the apps coupons sections. Quick access to every event being broadcast on SkySports from the homescreen. 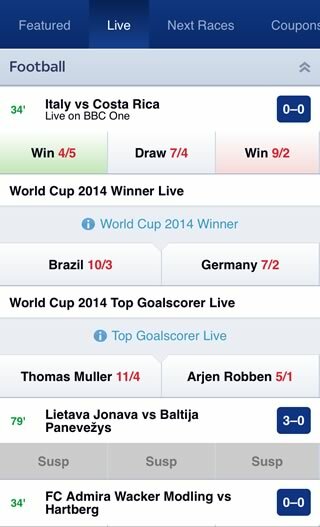 Brought to you by BskyB, Sky Bet mobile is available for download free of charge to iPhone, iPad and Android devices. Boasting coverage of over 4000 events weekly and access to over 20,000 individual markets, Sky Bet mobile offers quick and comprehensive betting on the move that is both sophisticated and secure. 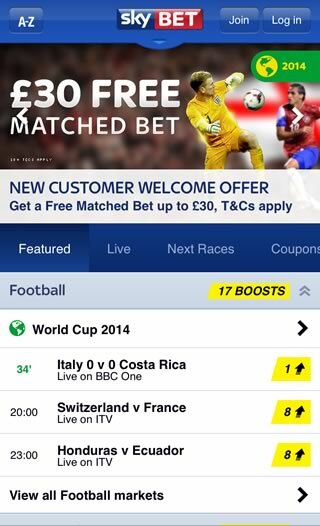 Sky Bet have developed specific betting apps for users of iOS or Android devices. A mobile site is also available for anyone using a BlackBerry, Windows Phone, Nokia Symbian or just about any other mobile device that has an internet connection. Sky Bet mobile offers extensive live and in-play betting, as well as live streaming and video of horse racing made available via its’ partner Racing UK. Although streaming and video is not available for football matches (perhaps understandable but a bit of shame given Sky Sports dominance of football coverage), horse racing fans are well looked after with over 4000 horse races streamed live each year. Races can be viewed from 5 minutes prior to the race and video footage of the race remains available for up to 30 minutes after the conclusion. 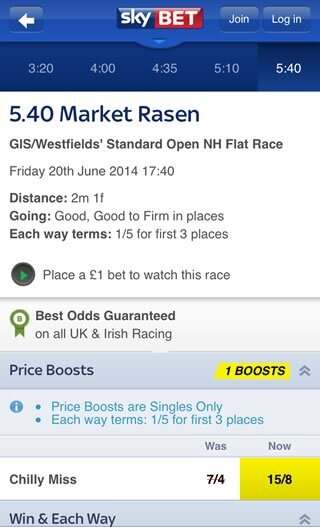 To access live coverage, all that is required is a minimum £1 bet on the race (or 50p either way). It should be noted, however, that live streaming is only available on the Iphone and Ipad devices and not for Android handsets or tablets. Due to the ubiquity of Sky television and media, the app feels instantly recognisable with its’ familiar look and colour scheme. It is well organised and the many features available are simply set out. Users are met with highlighted bets centred down the middle of the screen with special prominence given, as you would imagine, to football and horse racing. Quick access buttons to other main sports such as golf and tennis are set out across both the top and bottom of the screen bookending the highlighted events. Within the various sports the layout remains simple and logically organised. Racing, for example, is set out according to the time of the next race along with race meetings, ante post and a specials section. Football provides quick access to live matches in-play. 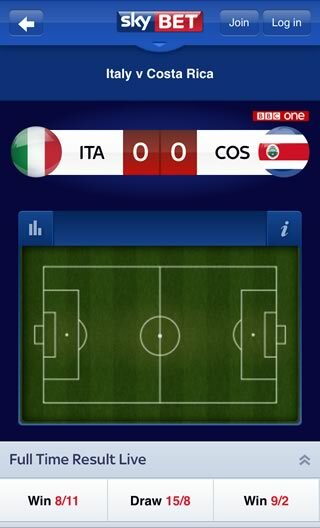 Your betting slip can be accessed speedily at the push of a button towards the top of the screen and both the font and layout make the app very easy on the eye. Navigation is quick, slick and problem free and provides a very user-friendly experience. Sky Bet mobile currently offers one of the best promotional offers around to new customers opening an account via their mobile handset. Register via your mobile as a new Sky Bet mobile customer and receive a free £10 bet that will be waiting for you in your betting slip. Perhaps more impressive, however, is that customers need only place a £5 bet (hardly a big ask for even the most conservative punter) every week in order to receive a further free £5 bet weekly until the end of the season. What is particularly attractive here is that there is no minimum amount to be deposited in your account when registering and the free bet is redeemable immediately. This is in contrast to many operators who require customers to have betted through their original deposit before being able to claim their free bet and, all too often, other terms and conditions apply to the cashing in of winnings accrued from free bets. Not so here and the signing up promotional offer is refreshingly straight forward and not limited to a one-off account opening deal by providing continued rewards throughout the season. Sky Bet loyalty is additionally a unique way of earning further free bets or even money off your Sky bill for Sky customers. Sign up to the loyalty scheme (note: via the website only and not via the app) and you will be rewarded for your betting activity. For each day that you place bets equivalent to £10 or more (either in the form of a single £10 bet or smaller bets throughout the course of a day that add up to £10) you will receive a loyalty stamp. At the end of the month your stamps will be totalled up and for every five stamps earned a reward of either a free £5 bet or £5 off your Sky bill will be given. Free bets or money off up to a total of £20 each month are available. This is a nice feature and follows on nicely from the impressive signing up offer. With £50 per month needing to be wagered, the loyalty scheme is not beyond the reach of many customers. 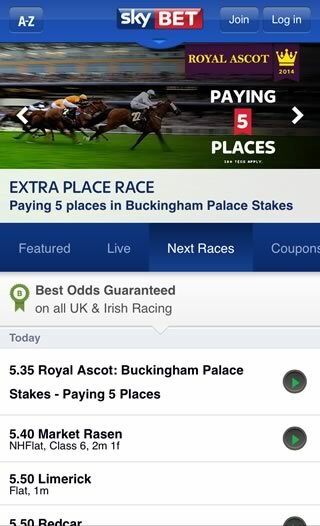 Betting on a comprehensive range of markets is available to punters via the Sky Bet mobile app. What is most impressive about the Sky Bet markets is the range of specials available, particularly in the football and horse racing markets. A nice touch on the app is that each featured football match highlights the number of potential bets available and a huge array of bets can be made via the coupon and specials sections. Specials are both wide ranging and inventive; for example, football specials include first goal scorer price boosts, enhanced accumulators and half time price boosts and cover bets as diverse as which clubs players will sign for in the closed season to which managers will take over at certain clubs. Horse racing fans are also offered a plethora of specials on highlighted events such as The Grand National and Ascot. The only minor complaint arises from there being less money back offers and price promises across the board compared with some other mobile betting services but, despite this, punters are more than adequately catered for by the range of bets and specials on offer. The Sky Vegas mobile casino also offers betting on a huge number of games from roulette to Monopoly for those with a penchant for gaming. Customers can easily manage their account via their handset and there is plenty of information available to customers with issues as a first port of call in the Help and Support section on the app. For personal contact, customer services can be accessed via email or phone, both domestically and overseas. Deposits and withdrawals are straight forward and Sky Bet offers 100% security to customers managing their accounts. 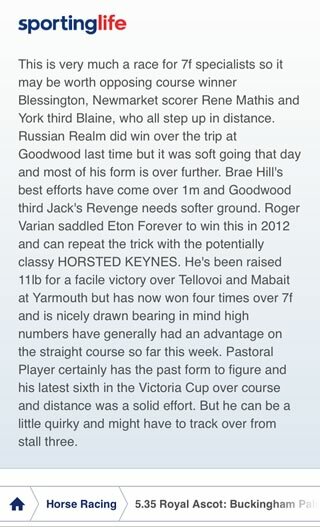 Overall, as you would expect, the Sky Bet mobile app is a very professional app that is smooth and quick to use. Although not necessarily at the forefront of mobile betting in terms of innovation or market offers, it is never the less a very solid app that provides an efficient and reliable mobile betting tool. For the majority of people, betting on the move is all about having a safe and error-free app at their disposal and this one fits the bill. With its’ impressive account opening offer and continued rewards for use, this app is up there with the best of them and should not be overlooked when considering which mobile betting app is the one for you.